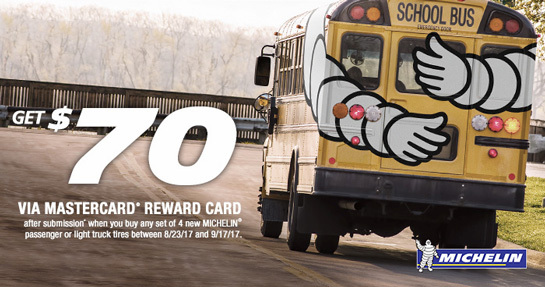 Receive a $70 Mastercard prepaid card by mail when you purchase a set of four Michelin tires from August 23, 2017 through September 17, 2017. * Backordered (out of stock) items do not qualify for the rebate. * Customer must mail in original invoice received with the tire shipment. Printed online order confirmation or email will not be accepted.